Industrial applications are usually in need of proper soundproofing solutions to ensure workers are exposed to an acceptable sound pressure level and residual noise at the fence is within the regulatory limits. STOPSON is able to support all industries in the field of acoustics, providing top engineering consultancy and high performing noise abatement solutions. Installation needs increasingly require the use of chilled water, which is produced by specific compressors or refrigerators groups, often a forced air cooling system consisting of ventilation fans and by different automatisms and regulations is present. These machines, according to their functions and characteristics, must be placed outside, i.e. an open place, and are usually installed in spacious courtyards, on terraces. These installations release sound emission into the environment, that often reach the ownership thresholds with values exceeding the tolerability, especially on night operations. During the project design of soundproofing chillers, the particular acoustic and fluid dynamics characteristics of these machines must be taken into account. Two sound sources can be identified: the fans, that allow air to flow into exchange coils; the compressors. The sound/acoustic spectrum is rather linear at mid frequencies, whereas it reveals acceptable sound levels at high frequencies, and possible peaks at lowest frequencies. From a fluid dynamics point of view, these machines have a strictly limited ventilation system in common, which is perfectly integrated with the needs of the machine. Engineer has then to consider on one side sound emission and on the other side few mm w.g. that are acceptable for such kind of equipment. An accurate design of the soundproofing machine equipment allows to reach targets without compromising the plant functionality, where the machine is installed. 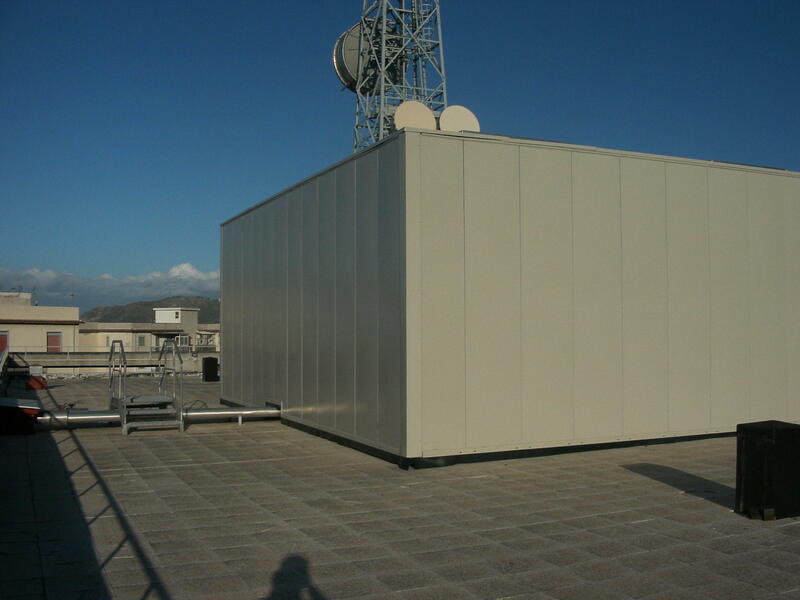 This solution permits to isolate the sound source from the disturbed area. In the simplest cases, the solution consist of a soundproofing screen, whereas in the most complex cases, it is possible to add silencers on the ventilation circuit, thereby creating a set of soundproofing enclosures, combined with the machine, in order to completely acoustically isolate it in any direction. In a natural gas pipeline station either related to distribution and compression noise is emitted from the main devices as well as auxiliary equipment. In case of compression station, the main machine is the compressor driven by a turbomachinery or an electric motor. 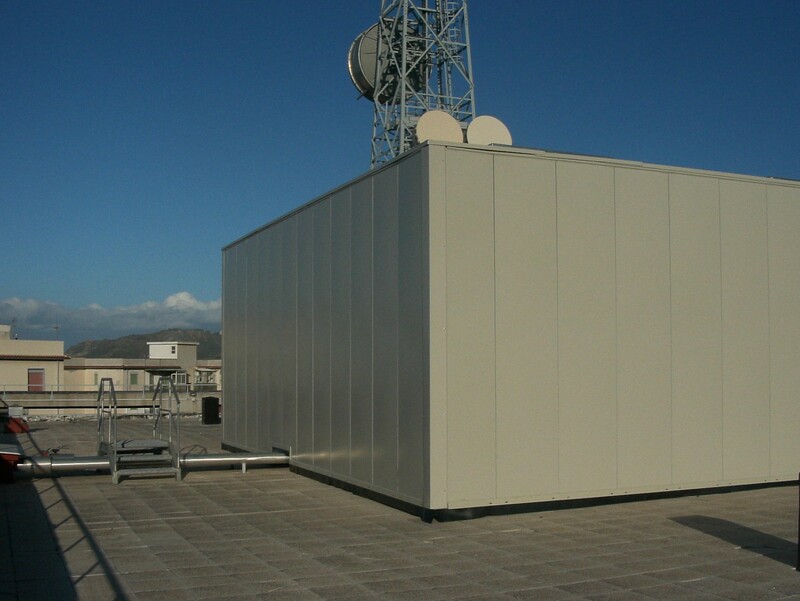 In both cases soundproofing is necessary to keep noise emission from the station within the limits imposed by the installations boundaries whatever they are industrial or residential. 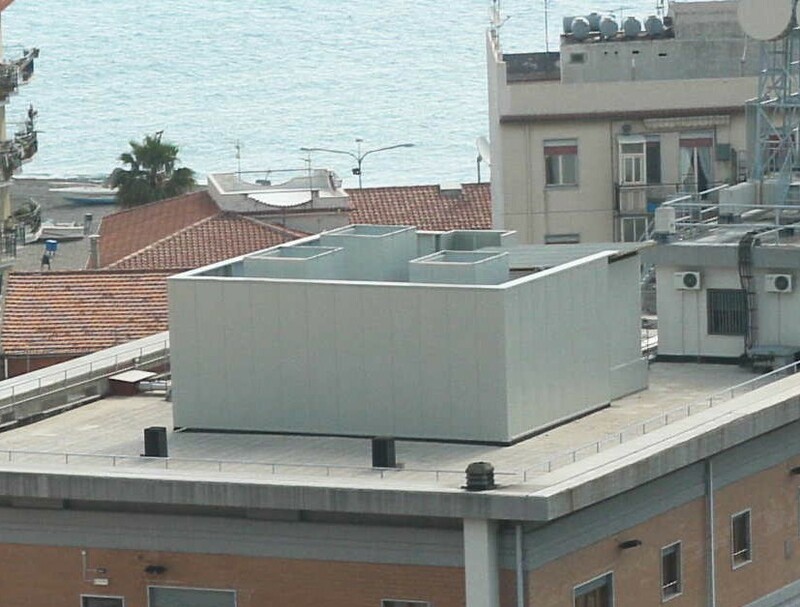 In addition, natural gas venting systems (emergency, fuel gas, etc.) requiring special silencers to be designed taking into account the sudden discharge of natural gas which can be a lot of degrees C below ambient air temperature. 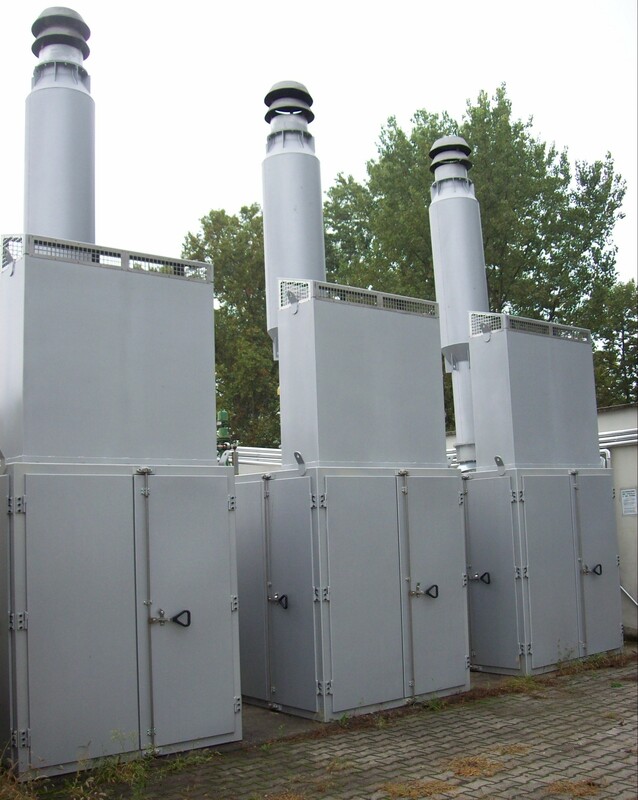 In case of distribution station two main sound sources need to be soundproofed: regulation valves for pressure reduction and natural gas heaters. 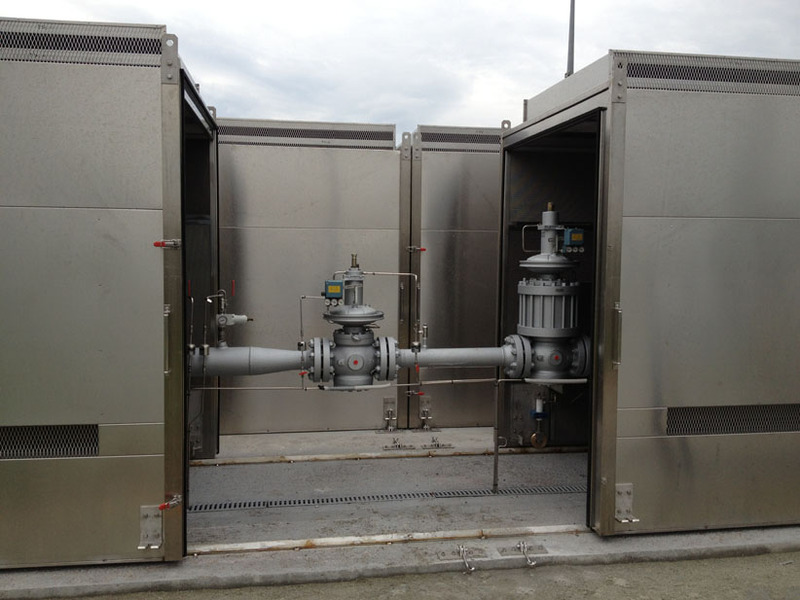 With regards to pressure reduction valves a special soundproofing solution with sliding and removable enclosures is conceived in order to reduce noise within acceptable values, while also enabling easy maintenance in an open space. Gas heaters require instead a specific enclosure with natural ventilation and a properly-sized silencers for air intake and exhaust stacks to the atmosphere.